With so much information floating around the internet, it can be a little overwhelming to figure out what to do next, where to learn more, or who to hire that is trustworthy and reputable. So I’ve compiled a list of Author Resources to help you! All the resources below have my recommendation because I’ve either used it, read it, or worked with the person or company listed. If you don’t see what you are looking for, contact me and maybe I can help you find what you need to get the job done! The most important marketing tool for an author is their website. Check out these great companies to make sure you have the best options for your website needs! If your budget only allows you to invest on one thing, let it be an editor! They are worth their weight in gold… er, words? What I’m trying to say is you MUST have an editor. Divas at Work – editing services and proofreading, novel critiques, book cover design. If there is one thing an author needs, it’s a tribe. A group where they can learn, share, support and encourage each other during this crazy ride called authorhood. The groups listed below are ones who have been there for me from the beginning and which I’ve found to be the most helpful. I’ve met some wonderful people in these groups. I’d love for you to join me there! I get asked a lot if I handle marketing and promotions. Unfortunately, I do not. I can brainstorm ideas and tell you what I’ve learned, but I don’t help with creating strategies or plans. However, I can point you to those who can! Check out these businesses below to get awesome help with your book promotions and marketing plans! BLOGS, PODCASTS, and COURSES, Oh My! I highly recommend each of these blogs, podcasts, and courses. I’ve learned a lot from each one, as these authors don’t mind sharing what they’ve experienced and the processes which they’ve found to be more efficient and successful. What would an author do without organizational and time-saving software and websites? Let’s not find out. Below are programs which I use as an author, as well as ones I use for my Sidekick business to help with project management and organization. DropBox – cloud-based storage program to help keep your files, graphics, manuscripts, documents and more. Google Drive – cloud-based storage program, also has features for creating documents, spreadsheets and more. Scrivener – robust program for authors to write their novel. Asana – project management program. Basecamp – project management program. Jutoh – ebook and paperback formatting program. Vellum – ebook formatting program (only available on MACs). Canva – graphics design program (web-based), which has templates for social media images and even book cover templates! Every author has a shelf (physical, virtual, or both) that is full of resource books, and I’m no different. Here are some of the ones I’ve found to be most helpful in my journey. 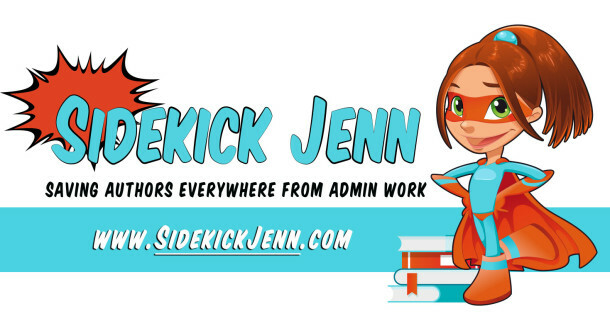 The Author Sidekick is a participant in the Amazon Services LLC Associates Program, an affiliate advertising program designed to provide a means for sites to earn advertising fees by advertising and linking to Amazon.com.